I'm a progressive and I should like Kamala Harris � but I don't. I donate to candidates of color running for president, and I prefer to vote for women over men for all offices, including for president � I consider Kamala's demographic background as "ideal" for a presidential candidate. But there's a big conflict in her progressive credentials because she was a criminal prosecutor for so long, and then Attorney General (which is like the capo de tutti capi of all prosecutors). And I can't get past that � so my support goes to other progressive candidates. This book attempts to reconcile that conflict. On the campaign trail in 2019, Kamala calls herself a "progressive prosecutor," whose goal was to change the system rather than perpetuate an inherently racist system. 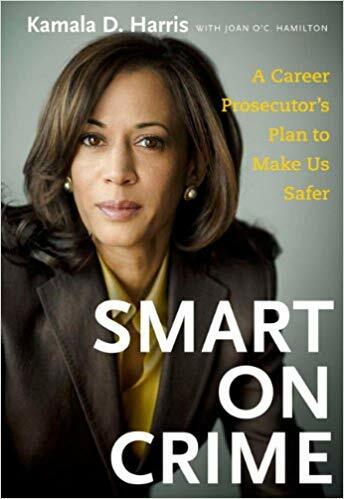 So I read Kamala's book about her time as a prosecutor � this book was published in 2009 � in the hope that she could prove her case � and her 2019 book as well. Her record says she is just another prosecutor, not a progressive prosecutor at all. Yes, she believes in applying some social programs to replace imprisonment (that's the core of the progressive view of the criminal justice system) � but she believes in the current concept and implementation of policing / arrest / imprisonment. Progressives don't believe in that � we instead believe that the current criminal justice system is inherently racist, and inherently unjust, and only radical overhaul can change that. Kamala believes in some incremental reforms, but not radical overhaul. To her credit, Kamala believes in SOME parts of the progressive agenda in criminal justice reform, in particular in her attitude toward the War on Drugs. In this book, she portrays herself as a Drug Warrior: "Drug crimes exact a terrible toll and rob people young and old of hope," she intones in the book's introduction. Phrases like that scream "watch out! conservative nearby!" and are antithetical to core progressive values. But since announcing for the presidency, Kamala has changed her attitude on the Drug War, asserting that marijuana "gives a lot of people joy, and we need more joy in the world" (for example, Washington Post, Feb. 11, 2019). Yes, THAT is a progressive attitude � but to count as a "progressive prosecutor," Kamala would need to expand her expressions of joy into criminal sentencing guidelines that shut down the rest of the war on drugs � which she didn't do in this book, and hasn't done yet on the campaign trail. Progressives are overjoyed that Kamala sees joy in marijuana use � but we're still waiting for how she would spread "more joy in the world," based on that. Kamala does "get it" on what progressive policy demands for criminal justice reform: she describes "the courage to reject the myths and the outmoded approaches of the status quo". Her solution to replace the "outmoded approaches" is to focus prosecution on violent criminals instead of nonviolent offenders (that's the focus of the book's preface and introduction), and to apply social programs to nonviolent offenders, after arresting them but before incarcerating them. In my view, that is MORE progressive than most prosecutors, but it ain't progressive. That was 2009 � has Kamala "evolved" since then, to "get it" on criminal justice reform? In her 2019 book, The Truth We Hold, she writes, "America has a deep and dark history of people using the power of the prosecutor as an instrument of injustice -- of innocent men framed, of charges brought against people of color without sufficient evidence, of prosecutors hiding information that would exonerate defendants" (pp. 24-5). Yup, that is how I view the existing criminal justice system, and as a progressive, I do appreciate that Kamala understands that viewpoint. That's definitely MORE progressive than prosecutors who DON'T understand and express that viewpoint, but by accepting the existing framework of the current system, she's not really a "progressive prosecutor." Kamala does NOT "get it" on the progressive viewpoint of the moral aspect of criminal justice reform either: here's an example that demonstrates she has not evolved by 2019. In her new book, she describes spending several years "disrupting the network of brothels masquerading as massage parlors" (p.35-6; that's police-speak for "shutting down whorehouses and arresting prostitutes"). Phrases like that scream "watch out! moralizer nearby!" and are even more antithetical to core progressive values than her drug warrior talk. How is founding a program to shut down brothels (a non-violent crime) focusing on violent criminals? Kamala justifies that by showing how she established "a safe house for sexually exploited youth--a sanctuary that would offer substance abuse and mental health treatment." That's a good progressive action, but Kamala couched it among an arrest-prosecution-imprisonment program. Bottom line: Kamala Harris has a demographic background that appeals to progressives, but this book disqualifies her from consideration as a "progressive" candidate. If you believe in being "tough-on-crime" but you consider social justice important to add to the criminal justice system, then Kamala is a good candidate for you. But she ain't no progressive. Kamala Harris: Smart on Crime: focus on violence, youth, & prevention. Kamala Harris: Crime pyramid: nonviolent offender isn't hardened criminal. Kamala Harris: Treat crime economically: most safety for the investment. Kamala Harris: Deal with drug addiction in offenders, but still arrest them. Kamala Harris: Grandfather served as high-level diplomat in India.